One of the best books I ever read (and I’m a lifelong reader) was “Confessions of an Advertising Man.” It was written in 1963 by one of the original Mad Men, David Ogilvy, who started his firm (now Ogilvy & Mather in London, and OgilvyOne in New York) back in the 1950s. The reason his little book was such a good read was because it was very inspirational. Ogilvy told of how he started with nothing but a dream and built up one of the greatest advertising agencies in the world. 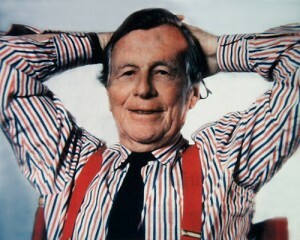 Ogilvy, who died in 1999, was a natural born salesman. His spirit still infuses the company, which just announced a worldwide contest, open to anyone over the age of 18: to create a short YouTube video in which you sell a red brick. Yes, a red brick. “If you can sell a red brick, maybe you can sell anything,” a company executive was quoted in the N.Y. Times. When I read this, I was instantly reminded of A Really Goode Job  and, before that, of the Rockaway deal with bloggers . (Most readers here know all about those.) Both were, of course, instances of wineries experimenting with how to use social media and engage a new generation of consumers, the former through a contest. It made me wonder if the Ogilvy people knew about them. In other words, the contestants are going to have to sell the sizzle, not the steak, since, in this case, there is no steak. They will get to display sheer artistry and talent. This brings up all kinds of ideas about marketing wine. Some wines sell themselves: they get great scores, collectors lust after them, there’s a waiting list for the mailing list, and they’re home free. Other wines have to be sold. We’re seeing a lot of attempts to sell now, but wineries seem to be scrambling to find the right message, the right price point, the right strategy. So everybody is jumping into social media. Think about it. When the reformists in the streets of Tehran want to talk to the world, they tweet. That’s the same reason the old regime in China wants to censor searches: so their people can’t interact with the outside world, or even each other. That’s the big picture. What about the smaller world of wine in which we live? Wineries are on notice they have to sell harder than ever before. For some, that means they actually have to learn to sell in the first place. David Ogilvy famously said, “No sale, no commission. No commission, no eat.” It’s the old law of the jungle, and social media — no matter how revolutionary it turns out to be — isn’t going to change it. Just a small quibble, Steve, as I just finished re-reading Confessions of an Ad Man (a different book, but not as impactful as “Olgilvy on Advertising”). Olgilvy was all about selling the steak. He pioneered the modern day substantive sell, picking up tenets from Claude C. Hopkins. In addition Olgilvy was staunchly against creativity for creativity sake believing that simpler was better. His philosophy is counter to much of what we see today from famous shops like Crispin, Porter + Bogusky who do Burger King and a bunch of others — they are all about the creative to create attention with attention equaling mindshare. Olgilvy represents advertising as true selling. In fact, I’ve written about this recently. So, long story short — the winner of the Red Brick contest will win because they sell the value of the brick and not the sizzle, as you suggest. my takeaway from the NY Times article was not even close to what you’re suggesting, RE “a contest to bring attention to their social media efforts.” i would imagine as a long-standing global advertising entity, they are sooo beyond the little-winery-that-does-use-social-media stance. anyway, social media is a strategy, not a creative sales concept, which seems to me to be what they’re looking for in their contest. do you think OR has a different online NY Times article than CA? hmmm. One of his Big Ideas was to create a mysterious character to build intrigue around his clients’ brands, the most famous being the Hathaway Man. Another such character was Commander Whitehead for Schweppes. It isn’t a stretch to see how The World’s Most Interesting Man (Dos Equis) is an evolution of this approach. Oh that a vintner might take so brave a step and set aside the glass-and-bottle shot, the minutiae of winemaking and the grandeur of their property to actually SAY something. Steak and sizzle, if you will. Stephanie, I don’t know the difference between “strategy” and “sales concept.” I think social media is both. what i meant by “sales concept” was, what’s the big idea that will sell what you’re trying to sell? call it the sizzle, call it what you will, but if someone’s selling a pen, for example, they’re not selling a plastic tube filled with ink, but the instrument that will one day write the cure for [fill in the blank]. once you have that creative nugget (based on my example, the selling concept that a pen is elevated in status to a potential life-saving device, in the broadest sense) in place, then the next step is determining how to get the messaging/imagery that falls from it out to your audience, or, in other words, to determine the strategy. that’s where social media may or may not come in to play, depending on where your audience is hanging out these days. but social media is not the “big idea”/sales concept; if people think that it is, they won’t get far. we all know that at a very basic level, social media are simply tools to send messages out with and to interact through. and of course there are varying degrees of creativity with how social media gets used, but in the end, they’re just the vehicles to send all the messages based on the sizzle/sales concept through. Stephanie, thanks for explaining in more detail. Now I see what you mean, and I agree. It’s not enough for a winery to merely hire a SM director to tweet, blog, etc. That’s “a plastic tube filled with ink.” Instead, the winery has to figure out how to convince the public that it’s [fill in the blank]. pretty much. and imagine the poor SM director who has nothing more to tweet about than the typical “warm days, cool nights” and “pairs well with” blah blah! Below is an excerpt that defines today’s consumer and thier decision making habits. Steve, by the way, are you on youtube at all? Youtube is one of the top 5 all time social media sites, without question. Brett, yes I have a couple YouTubes. You can find them under my name. Sorry, I can’t resist. Where’s the contest where someone tries to sell Chardonnay grapes in the current market? Received email today from winery who contacted me a month ago sourcing 100T only to tell me they’ve re-calculated and they are long on Chardonnay. I’m just sayin’. A red brick has nothing on the current global market that pertains to your favorite grape and mine – California Chard.